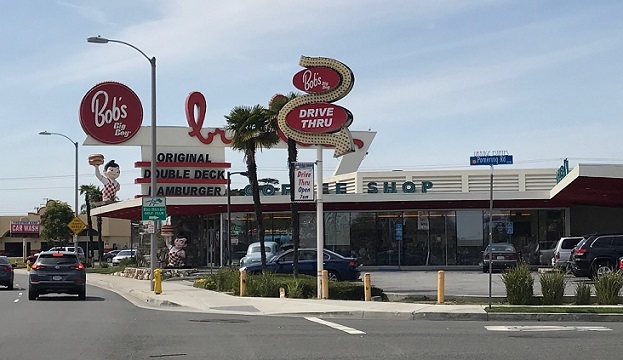 I made a special trip to the Bob’s Broiler in Downey — a classic coffee shop that the Bob’s Big Boy chain rescued — for lunch recently, and got not only a good experience but a Wednesday column out of it. Now that’s satisfying. Has anyone been there, or know Downey? I grew up in Norwalk and as a teenager used to cruise Harvey’s Broiler. My friends and I would cruise thru Harvey’s then drive over to A & W in Bellflower, cruise their parking lot, then start over. Occasionally we would get something to eat. Our favorite was Swamp Water from A & W, a combination of their root beer and orange juice. My stomach revolts today at the thought of drinking Swamp Water again. I’d never heard of Swamp Water, Bonnie, but my stomach is revolting at just the description. Thanks for writing.